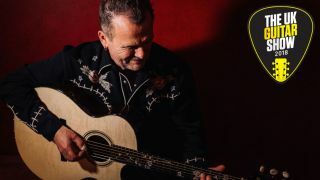 British folk guitar maestro Martin Simpson has been added to the line-up for the forthcoming UK Guitar Show, set to take place on 29 and 30 September at Olympia, London. The Scunthorpe-born, Sheffield-dwelling folkie is regarded as one of the finest acoustic players on the planet. Whether appearing solo or collaborating with the likes of Richard Hawley, Bonnie Raitt and Martin Taylor, Martin's reputation as a jaw-dropping guitarist precedes him. He has been nominated 23 times in the 11 years of the BBC Radio 2 Folk Awards, including nine times consecutively as Artist of The Year, which he has won twice. You can witness this folk legend for yourself on the Main Stage at 11am on Saturday 29th September. 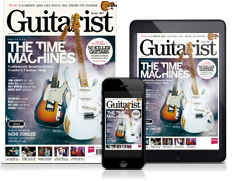 Brought to you by the organisers of the London Drum Show and the London Bass Guitar Show and in association with MusicRadar, Guitarist, Total Guitar and Guitar Techniques, the UK Guitar Show is set to be the ultimate weekend celebrating all things guitar. Alongside appearances from Martin Simpson, Simon McBride and more, there will be guitar lessons from expert tutors, gear demos, panels and the live final of the Guitarist Of The Year 2018. Advance tickets are on sale now - get yours now to see Martin, Simon McBride and more artists yet to be announced. Main Stage tickets are also on sale, you can secure your place for £5 or try your luck for one of the free tickets we hand out at the show on a first come first served basis.